Robert Phinisee, McCutcheon: The future IU point guard scored 32 points and added nine assists and six rebounds in an 84-55 win over Kokomo on Dec. 8. In Saturday’s Forum Tip-off Classic at Southport, Phinisee finished with 22 points, six assists and five rebounds in a 63-58 loss to Indianapolis Tindley. McCutcheon is 4-2 this season. Damezi Anderson, South Bend Riley: Anderson started off the week strong with 25 points on Dec. 5 in an 84-55 win at South Bend St. Joseph. He followed that performance up with 19 points in a 62-48 win over Mishawaka on Dec. 7. In Saturday’s Forum Tip-off Classic at Southport, Anderson had 23 points and eight rebounds in an 81-75 overtime win over Jerome Hunter and Pickerington North. Jerome Hunter, Pickerington North (Ohio): The IU signee had 19 points, 10 rebounds and four steals in a 59-41 win over Pickerington Central on Dec. 8. In Saturday’s Forum Tip-off Classic at Southport, Hunter finished with 21 points in an 81-75 overtime loss to South Bend Riley. Hunter picked up two technicals in the loss. Jake Forrester, Westtown School (Pa.): Forrester finished with 18 points and 10 rebounds in a 76-66 loss to Our Savior (NY) on Dec. 3. Forrester had 22 points and 10 rebounds in a loss to Georgetown Prep at the National Hoop Fest on Dec. 9. Forrester was scoreless in 10 minutes in a 77-69 win over Holy Spirit at the National Hoop Fest on Dec. 10. Romeo Langford, New Albany: Langford played through an illness on Friday night, but it wasn’t enough as the No. 1 Bulldogs fell 49-47 in overtime at rival Floyd Central. Langford finished with 15 points in the loss. He bounced back at Saturday’s Forum Tip-off Classic at Southport as he went for 42 points in a 97-59 beatdown of Keion Brooks Jr. and Fort Wayne North. Archie Miller and Tom Ostrom attended the Floyd Central game and Ostrom was in the stands again on Saturday. Trayce Jackson-Davis, Center Grove: It was a huge weekend for the junior forward as Jackson-Davis had 21 points, nine rebounds and five blocked shots in a 55-38 win over Pike on Dec. 8. Jackson-Davis was even better on Saturday in the Forum Tip-off Classic at Southport as he finished with 31 points, nine rebounds and six blocks in a 65-63 overtime loss to Hamilton Southeastern. Keion Brooks Jr., Fort Wayne North: Brooks, the state’s top ranked junior, had 25 points in a 76-52 win at Fort Wayne South on Dec. 8. In Saturday’s Forum Tip-off Classic at Southport, Brooks finished with 18 points and seven rebounds in a 97-59 loss to New Albany. I’ve become increasingly curious about Race Thompson as he factors to play a significant role next year, particularly if the drumbeat of Juwan’s going to the NBA increases. I hear he’s practicing and will have an advantage next year but little more beyond that. Anyone else out there have a bead on Race? I’m not hearing an NBA drumbeat for JM. I am hearing plaudits for a kid who is coming into his own but doesn’t have the outside game yet to break into the NBA early (IMO). I hope he will test the waters..attend tryouts..learn what the pro’s think of him and then come back for his senior season at IU. Would love to see him play well enuff to make an all B-10 selection end of year. If that helps him toward his pro goal..good for him. Really enjoy watching him play right now. I’d be shocked if JM wasn’t a hoosier next year. He’s 2 for 11 on 3’s this season and prob a lil under 6’9″. I def believe he can get there but he’ll need another summer 2work on his jump shot. 1. Tracy Jackson Davis’s high ranking is deserved, Very quick off his feet and very quick with his moves. Needs to work on face up game as he likes to take a dribble or two then turn his back to defense. Make a couple of soaring moves to the basket but is definitely his habit to revert to the back down game. Also did not demonstrate much of an outside shot but his free throw touch looked good. I would compare him very favorably to Alan Henderson if his shot comes around. 2. Robert Phinisee- was not as athletic as I had heard and was disappointed that his team plays zone all the time. I know he is a big time scorer but did not shoot well Saturday. Saw a few glimpses of play making ability v Tindley but would need more looks to make a determination. I would say that right now Purdue got the better of deal with Hunter. 3. Damezi Anderson- was very impressed with his two late three pointers to bring his team back late, however displays the same out of control tendencies as Troy Williams on several drives. He is somewhat mechanical in his movements, much like Juwan Morgan. Had several big time rebounds against a bigger Pickering line up. Should fit well with Archie’s scheme after he cuts down on wild drives. Has a bigger upside than Morgan because of his shooting ability. Will good to get a year of tutelage under Morgan. 4. Jake Forrester- can you say Christian Watford clone. Very similar size and game to Waftord. Probably a better athlete but can score inside and out. Not a good a rebounder for his size and athleticism, at least in this game. Getting 2 t’s and ejected might raise some questions but it was a quick whistle by officials on Saturday. Referees in that game were there to be seen and his last foul before ejection was highly questionable. 5. Keion Brooks- super athlete with silky smooth game. Very skilled in many areas and highly underutilized by coach. I can see him winding up at prep school next year as a way to better advance his game. Seems like a kid who at times was deferring to teammates and letting the game come to him, but would like him to be more demanding especially as team was getting waxed. Can see him winding up at pUKe. 6. Saturday left no doubt who the best player in Indiana is by a long shot. The thing that separates him from the rest is his control. No matter the situation he is always in control of his body, eyes, and emotions. Combine that with his skill level and athleticism and the top ranking is well deserved. Every time I have seen him play he adds more to his game. Can’t wait to see what he does in the more wide open college game and then on to the NBA. 7 On a side note Jim Shannon shined as a coach again Saturday. He is one of the best in Indiana and demonstrated that again in this event. The key to my happiness this season is thinking about next year. Every game i watch, I’m looking at player progression & how i think guys will look next season. Adding these guys to JM, Davis, Al, Green, Smith, Race & CM makes me very happy. That would be the biggest team IU has had in quite some time. The future is bright & yes I’ve been wrong b4, but I truly believe in CAM. Btw 2spots still open so pls Romeo & a grad transfer. Jackson-Davis looked very good Saturday. The youngest Etherington was on the other team, and looks better than Austin, at least in one game. Keion Brooks was completely outclassed by Romeo Langford in the last game at Southport; hopefully it was just a bad game for him. 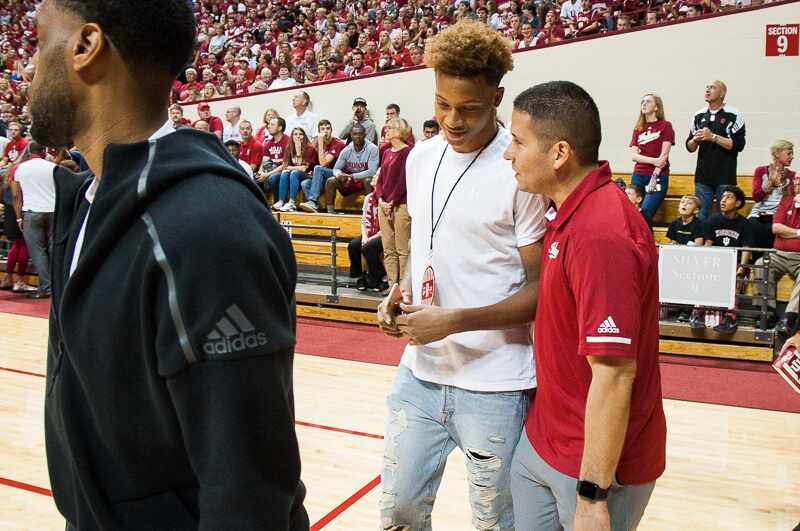 Phinisee will be a nice point guard for IU. His assist total probably won’t be great this year because he doesn’t appear to have much of a supporting cast. I believe u meant JHunter instead of Jake Forrester but thanks for the analysis. Although I hope you’re wrong on Rob. Yes, he’s talking about Hunter, not Forrester. Not sure how he compared Phinisee with the Purdue recruit Hunter. Phinisee is a point guard and Hunter is at best a combo guard; really more of a shooting guard. Hunter was guarding Phinisee some of the time and couldn’t keep him in front of him. Phinisee appears to have to score more this year since there isn’t much else on his team. I will say that Hunter was very quick, and shot very well, but is painfully thin. Still like to see some more height in the 2018 class. Maybe now with the extra spot from Curtis Jones leaving?